Casino mogul Steve Wynn sued Lloyd's of London Thursday, saying the insurance company failed to act properly on his demands to pay $54 million in lost value for a Picasso that was damaged when Wynn accidentally poked a hole in the canvas with his elbow. The lawsuit in U.S. District Court in Manhattan sought an order to force Lloyd's to expedite Wynn's claims for reimbursement and restoration costs for Picasso's 1932 work, "Le Reve," by providing him with an appraisal report or initial damages assessment. Wynn's representatives told Lloyd's in November that the painting was worth $139 million the day before Wynn damaged it in his Las Vegas office on Sept. 30, but was believed to be worth no more than $85 million afterward. 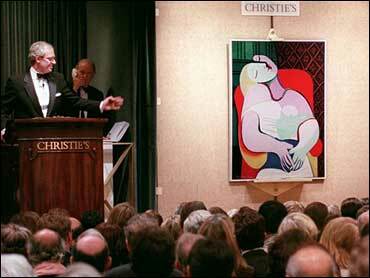 In 1997, Wynn paid $48.4 million for the painting depicting Picasso's mistress, Marie-Therese Walter. Wynn has described the damage to the canvas as a thumb-sized flap and said it was "the world's clumsiest and goofiest thing to do." He damaged the canvas as he showed it to guests, including screenwriter Nora Ephron and husband Nick Pileggi, broadcaster Barbara Walters, New York socialite Louise Grunwald, lawyer David Boies and his wife, Mary, and art dealer Serge Sorokko and his wife, Tatiana. A message left with a spokesman for Lloyd's was not immediately returned. In a letter included as an exhibit with the lawsuit, a Lloyd's representative wrote that he understood that Wynn's representatives wanted the insurers to estimate the level of depreciation at the outset, but that it was customary practice for the insured to make a claim first and for insurers to agree or disagree. Lloyd's has already agreed to pay $90,000 to restore the painting, a consultant fee of $21,000 related to the restoration and increased security that was required during the process.